Gas fire repair is our speciality at Chester Gas. 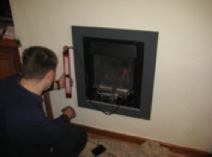 If your gas fire is not working, we may be able to fix it - whether it is not sparking, not staying alight, the pilot is going out, it will not turn up, or there is a problem with the coals or controls - we can diagnose the problem, and supply and fit spare parts from most manufacturers. If your gas fire needs a repair, then call us now on 07779 646 646 to arrange an appointment. If your gas fire stops working, your first thought may be that it has to be replaced. Often though, it can be simple and economical to repair - modern gas fires have safety devices that "fail to safe" and so getting your gas fire working again may be easier than you think. A properly maintained gas fire is safe, efficient, clean and economical to use. However, it is important to make sure that you have it serviced and maintained regularly. The flue may become blocked by bird's nests or other debris, and dust and fluff may build up in the fire burner - particularly if you don't use it all that often, or it has not been used much over the Summer. Most manufacturers recommend that gas appliances are serviced at least once a year.